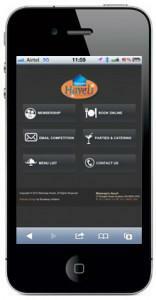 Help customers find your business online when they search for you on their smartphone! Get a mobile version of your desktop website today! Complete Cloud is a leading Australian company specialising in simple yet functional mobile website design solutions to help you ramp up your business. "What is the difference between a mobile and desktop website?" A desktop website has been designed to be viewed on a PC or laptop with sufficient space to display the website navigation and content. It has been optimised to be used on a larger screen with a mouse and keyboard. A mobile website has been designed to be used on a Smartphone with a much simpler navigation and content required for the Smartphone touch interface. Action buttons are also more prominent on a mobile website. If people view a desktop website on a mobile device, they often get frustrated by the difficulty of using the navigation and reading the content as the and often don’t spend much time on your site. Mobile websites are specifically designed to worked for users on the move that and need information quickly and easily. They also take advantage of mobile phone capabilities such as a click-to-call button which connects your customers to you quicker and easier. "What’s the difference between a mobile app and a mobile website?" A mobile app (application) can be downloaded by users on their Smartphone’s. They are specifically designed for a mobile operating system (OS) such as Apple’s iOS, Google Android or Windows Phone. Typically a separate application is built for each OS which means each application requires maintenance and updating for each platform. Mobile apps are typically a product that companies sell or offer for free such as the popular game Angry Birds. They are also used by larger companies to provide services to customers such as the Australia Post mobile app. 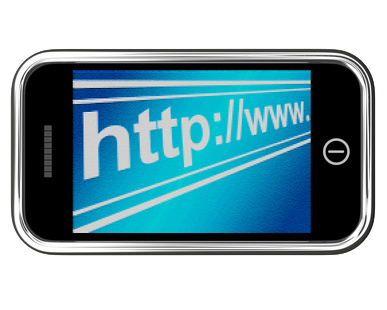 A mobile website is a Smartphone friendly version of your website. It is specifically design for the smaller screen and the touch input and is much easier to use with navigation, content and easy to tap buttons designed for the smaller screen. Mobile websites work on all mobile operating systems which means you don’t need to design a different mobile website for each of the popular platforms. Your mobile website will display automatically when someone access your website form their Smartphone and there is no downloads required. "Which is better, a mobile app or a mobile website?" There are advantages and disadvantages for both a mobile website and a mobile application. Each typically have different audiences. You need to compare both against what you are trying to achieve. "Can I see how my current website appears on my mobile?" Other than accessing your current website on your Smartphone, you can view how your existing website on Smartphone using a Smartphone simulator. Type Smartphone simulator, iPhone simulator or Andriod simulator in Google to find the most popular simulators. This will show you the bad experience your customers will endure by trying to find information on your current website on a Smartphone. "Why do I need a mobile website?" There are over 4 billion mobile phones currently in use worldwide compared to 1 billion PCs. Australia has a Smartphone penetration rate of over 60% which means that most people have a Smartphone and usage is continuing to increase. The most popular Smartphone usage is watching TV, listening to music and surfing the web. Provide your customers quick access to information about your business. "How do I design my mobile website?" Do they need your address? Do they need your phone number? Do they want you to call them? You also need to prioritise the key content on your website and determine the key information you want to present to your customers on the go. You need to design your mobile website with the end user in mind and allow your customers to find the information they are looking for in the quickest possible time. If you need help, our expert Mobile website team can help you increase your mobile conversions. "Should my mobile website have the same content as my desktop website?" Your mobile and desktop website audiences have different needs. To increase your conversion rates you need to tailor content to each audiences’ needs and create targeted content for your mobile website. People searching for you on their Smartphone have different needs than people searching on their desktop website and you want to ensure that your mobile website makes is as easy and simple as possible to interact with you. "Can I make changes to my mobile site myself?" You may be used to making frequent changes on your desktop website which is a standard feature of most websites. Mobile websites are different. As part of their design they are targeted to a few specific functions. Once the key elements of a mobile website are identified the remainder of content rarely changes. You can decide to go with a mobile website with a CMS (content management system) but you have to be aware that changes on a mobile website are more tightly integrated with your websites success than a desktop website. "How do people find my mobile website?" Automatic Redirection: When a user types in the URL of your regular website on their Smartphone, they will be automatically redirected to your mobile site making it seamless to your customers. Link: You can create a link on your regular website to allow your customers to switch between your desktop and mobile websites manually. Search: Search engines on users Smartphones will direct them to your mobile page automatically. "Is my site compatible for mobile SEO?" When we create your mobile website we follow the best practice recommendations created by the most popular search engines to give your mobile website the best opportunity to rank high in search mobile engines. "Can I see how many visitors I have had?" Your mobile website will provide you the ability to view reports on the number of visitors to your website and how they got there. Among other reports you can view the most popular content and the length of time customers are spending on each page. For advanced reporting you can integrate your mobile website with Google Analytics which will provide further in depth statistics on your website. "Do you provide support after my mobile website is created?" We provide comprehensive 24x7 phone, email and chat support so we are here whenever you need us. We can also provide you support on how to get the most out of your mobile website and ensure it is working for you the way you intended it to. Complete Cloud focuses on creating a mobile website that will make it easy for customers to interact with you and provide them a great experience. When creating mobile websites we ensure the website meets the mobile goals set by you as part of the design stage. It’s important to focus your site on providing your customers with what they want and also ensuring the site is designed to assist your business. Our mobile websites are also mobile SEO ready to ensure your customers can find you in the increasingly competitive mobile landscape.